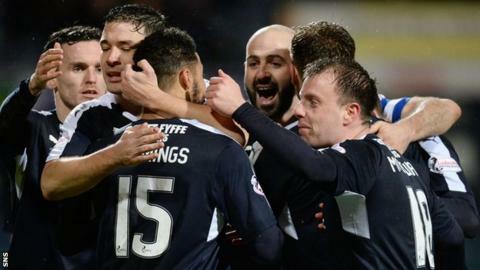 Dundee leapfrogged St Johnstone in the Scottish Premiership table with a dominant win at Dens Park. Kane Hemmings slotted in the first on the rebound after Greg Stewart's shot was parried by goalkeeper Alan Mannus. The on-form Dundee striker doubled his tally and the lead after Danny Swanson was caught in possession by Gary Harkins who played a neat through ball. Greg Stewart hit the bar as the hosts continued to have the best of the game against lacklustre Saints. Ten weeks had passed since St Jonstone had last recorded a win. That was eight games in all competitions, running adjacent to the Michael O'Halloran transfer saga. O'Halloran is now a Rangers player but their luck has not changed. It is now nine in a row and just two points out of a possible 21. They might be losing their grip on an astonishing record which sees them aiming for a fifth consecutive appearance in Europe. Dens Park had been battered by rain up to kick-off time and the surface, patched up in places, threatened to cut up badly. In truth, the players dealt well with the conditions and produced a match which flowed end to end with a series of chances, the best of which - in the first 15 minutes - fell to Dundee's player of the month Hemmings, who broke with a clear sight at goal, but could not hit the target. But there was no denying him after Stewart's blasted shot had been stopped but spilled by Mannus, with Hemmings on hand to capitalise from just five yards out. It was predatory finishing. Stewart and Hemmings, once a partnership at Cowdenbeath, were all over Saints and Perth goalkeeper Mannus had to look lively on a number of occasions with Dundee really sharp on the counter attack. They even had a penalty claim denied when Steven Anderson challenged Rory Loy. St Johnstone manager Tommy Wright was of the view Loy should have been booked for diving. But his frustration went beyond that decision and his team's failings even had him punching the dugout at one point. The rain was incessant for the 90 minutes and so too was the flow of the game. St Johnstone, despite an occasional flurry of defiance, were a shadow of their former selves and it was no shock when Dundee went two up. Swanson was robbed by Harkins, who played a wonderful pass through to Hemmings. He was single minded about his finish as he broke into the box. Dundee continued to dominate. Stewart rattled the bar, they were nerveless at the back and Harkins waltzed round opponents, the mud no obstacle to his dancing feet. St Johnstone, meanwhile, who have had a confusing season, endured a night as miserable as the Tayside weather and even three second-half substitutions could not ignite a turn of fortune. To be honest there was little about them. Only a late deflected Darnell Fisher shot caused Scott Bain any distress, but even then he pushed it over the bar. But it would be wrong to dwell on their failings and ignore the rising fortunes of Dundee. Manager Paul Hartley talked pre-match of them flying under the radar. Well, they are bang in the spotlight now. Match ends, Dundee 2, St. Johnstone 0. Second Half ends, Dundee 2, St. Johnstone 0. Attempt missed. Murray Davidson (St. Johnstone) header from the centre of the box is just a bit too high. Attempt saved. John Sutton (St. Johnstone) header from the centre of the box is saved in the top centre of the goal. Substitution, Dundee. Julen Etxabeguren Leanizbarrutia replaces Gary Harkins. Corner, St. Johnstone. Conceded by Darren O'Dea. Attempt blocked. Darnell Fisher (St. Johnstone) right footed shot from outside the box is blocked. Attempt saved. Liam Craig (St. Johnstone) left footed shot from the left side of the box is saved in the bottom right corner. Substitution, Dundee. Nicky Low replaces Rory Loy. Attempt blocked. Paul McGowan (Dundee) right footed shot from outside the box is blocked. Murray Davidson (St. Johnstone) is shown the yellow card for a bad foul. Rory Loy (Dundee) wins a free kick on the right wing. Substitution, St. Johnstone. John Sutton replaces Steven MacLean. Graham Cummins (St. Johnstone) is shown the yellow card. Greg Stewart (Dundee) hits the bar with a left footed shot from the centre of the box. Substitution, St. Johnstone. Liam Craig replaces David Wotherspoon.